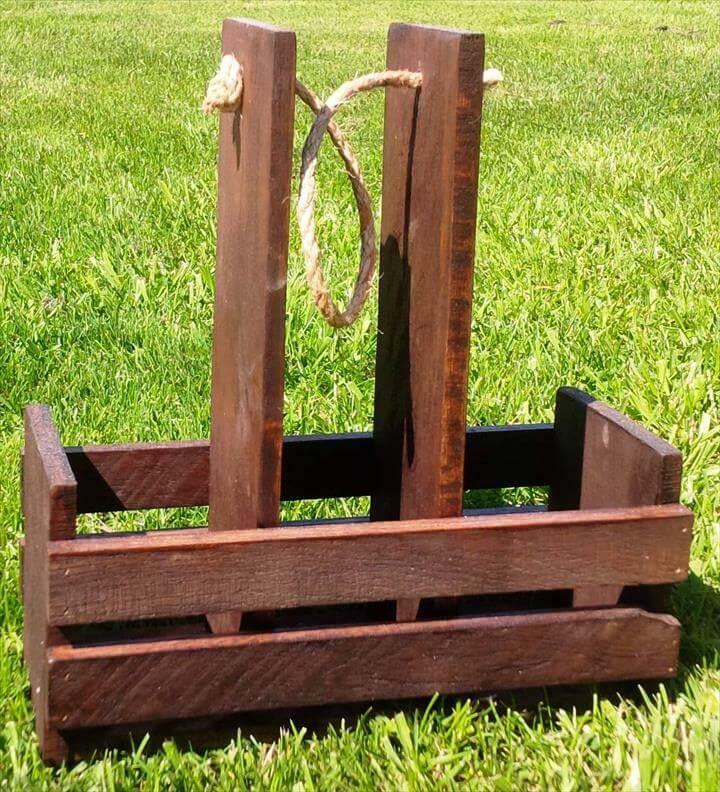 You will definitely love the idea of building fantastic caddies and wooden racks that all help to store nicely the beverage bottles carrying your favorite drinks! 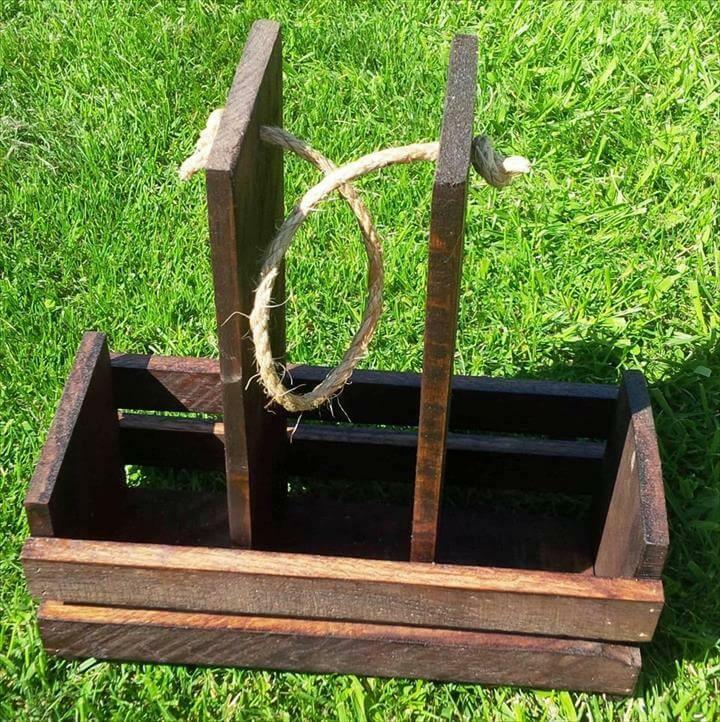 If you are a beverage lover or having a beverage loving friend then we have got here something special and gift-worthy for you, put a glance at this DIY pallet drink caddy, can be taken as a mini bar which comes with a nautical rope loop so can be hanged on any fixed wall support! Here the decided template of this drink caddy can hold well 2 beverage glasses and a beverage bottle in a super secure way but you can gain some more storage options or compartments in it to suit your storage needs! 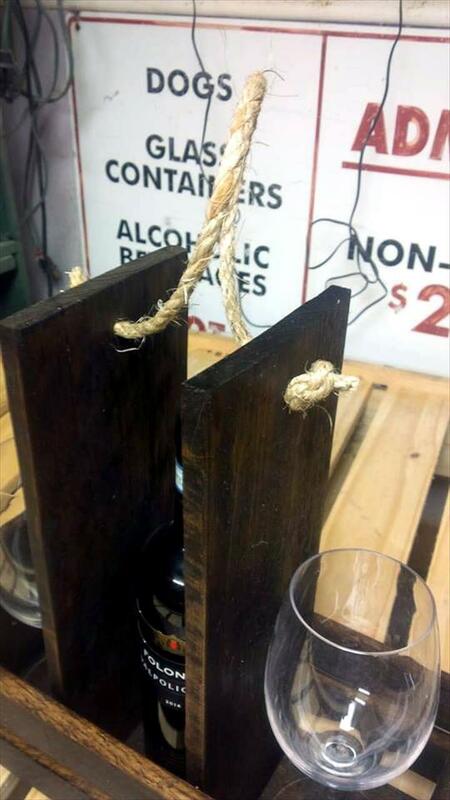 Here first of all the rough measurements and trials have been made fist by putting the separated pallet lengths around the glasses and beverage bottle and then the final sizes have been cut down and nailed in place to build the drink bottle and beverage glass caddy! Our all fans really like their all projects, Our Stevensville Friend doing great jobs. This awesome mini bar or drink caddy has been finished with minwax stain and sealer for a magnificent choco brown tone which is weather-protected also! 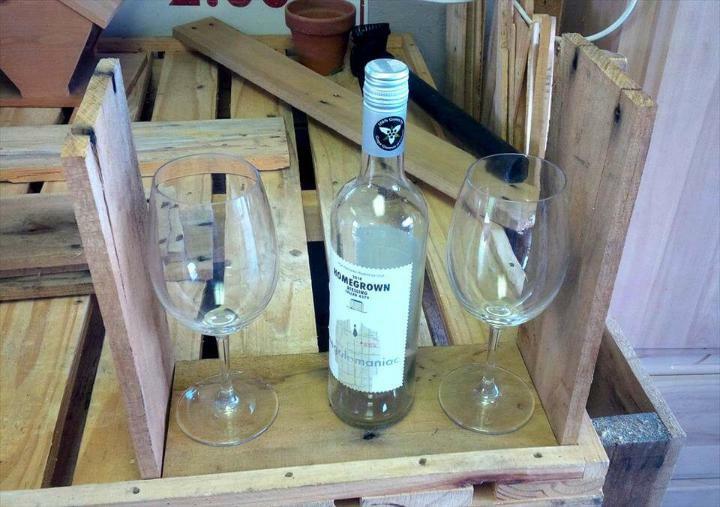 The beautiful wooden pallet drink bottle and beverage glass caddy built on a request, can even be used in gift-giving also! 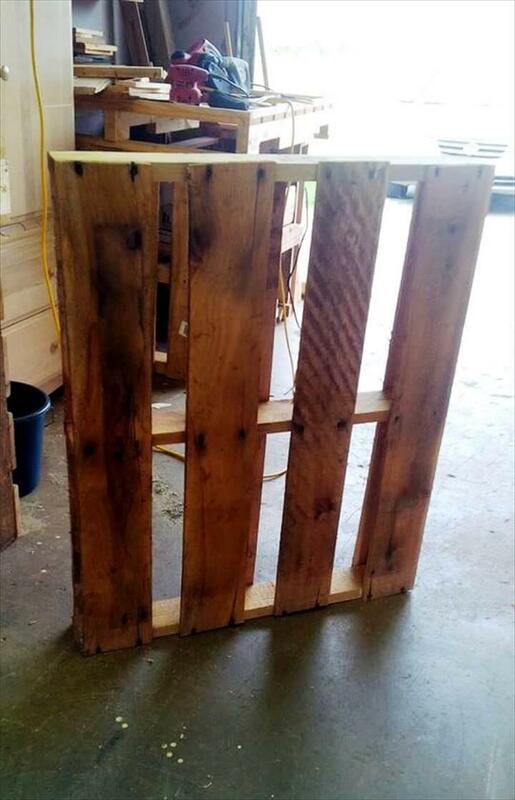 Grab a beautiful pallet board first, you can easily source a healthy looking pallets in the surrounding areas! The dumpsters, junky yards, construction sites, nurseries, food store and shipping areas would be ideal places to search for pallets! Take the selected pallet skid into pieces and just remove the nails from the them, then you can plan them for next level of construction! 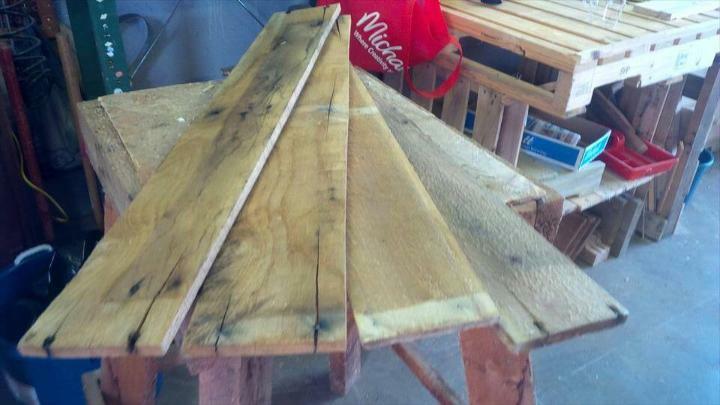 Before your figure out the sizes of pallet slats, it will be recommended to get them reconditioned through sanding, gritting and hand-rubbing! By going this way you will also get the splinter free and brighter pallet planks! First decide how many drink bottles and beverage glasses you want to store then build caddy according to storage demands! Here it has been decided that caddy will hold a 1 beverage bottle and 2 glasses so sizes of pallet slats have been figured out by just placing all around the beverage glasses and drink bottle roughly! 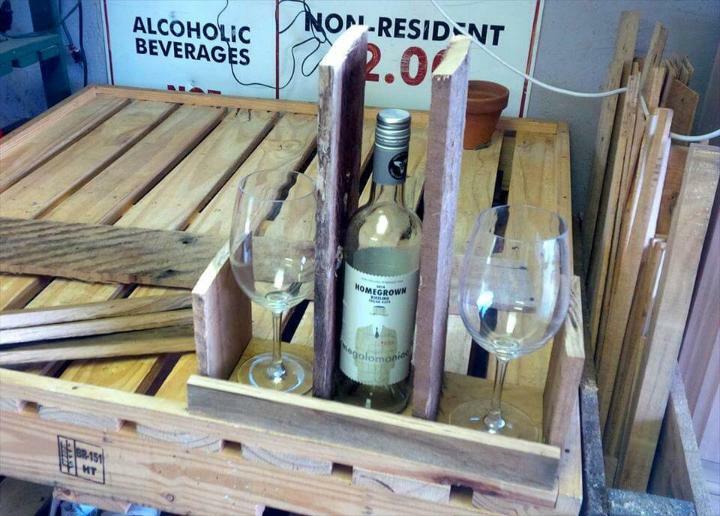 You can try the pallet slats multiple times to get the perfect sizes as precisely cut and sized pallet slats would provide all a better housing to drink bottle and beverage glasses! 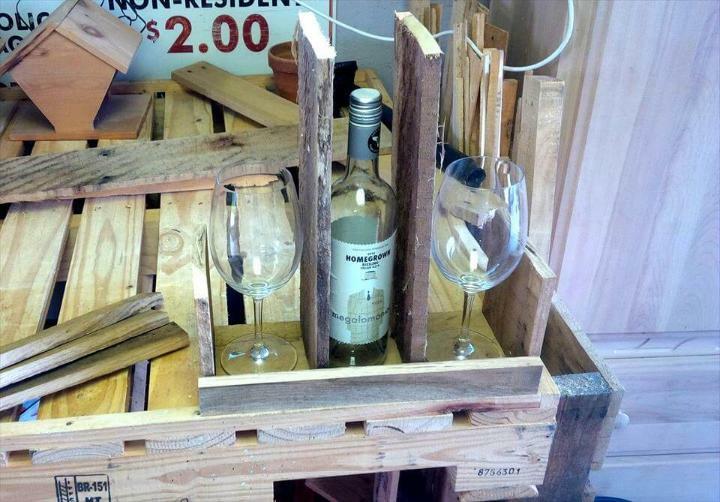 So take you time while sizing the pallet slats! Here 14″ high side slats was the ideal! 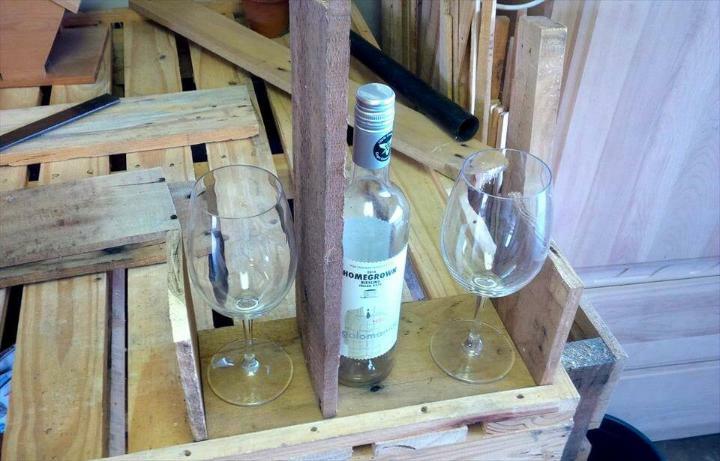 Add the side slats to base after you decide the design and dimensions and plan the mid slats, will hold the beverage bottle! 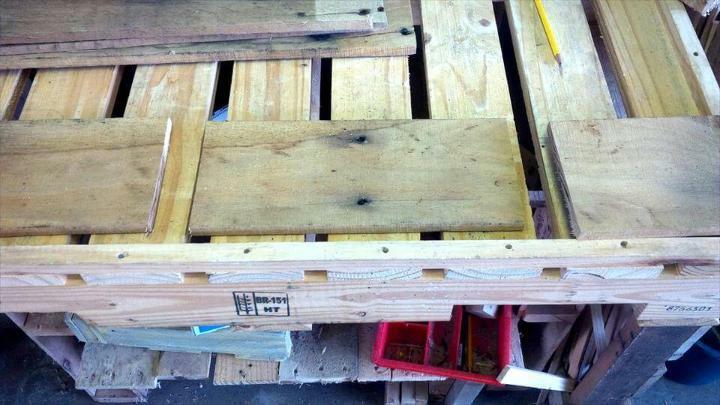 Here sides slats are 5″ high! 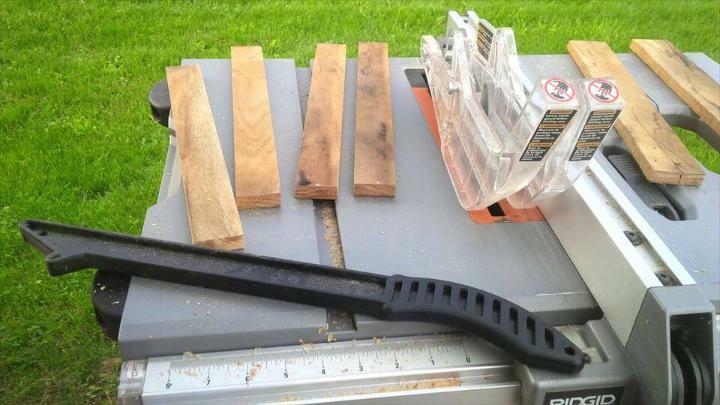 Now cut the side planks for caddy, just wear the safety gloves and glasses and stand in sides of a power wood cutter to cut the perfect sizes, here 13.5″ x 1.5″ pallet slats have been decided to build the sides of the caddy! Before you assemble all the parts tight with hardware, you can make sure once again that you have got all the sizes perfect according to measure values, you can do the dry fittings trial first as you can see here! It really look nice! After making sure that you have got the right lengths to compose the entire caddy, you can go for the fittings with hardware! Here it has been decided to add a rope-loop to caddy that will facilitate the hanging of caddy on any fixed wall support! So by leaving the 2.5″ inches from each side and a 1″ down, the mid point has been fount where hole has been drilled finely to add the rope loop! 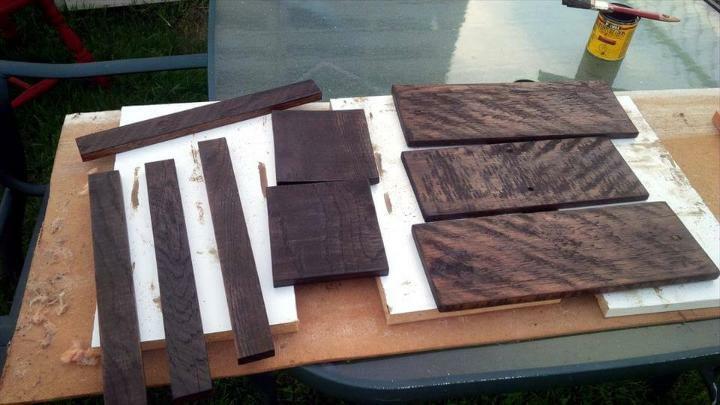 Finally all the parts have been finished with minwax stain, will keep the wooden surfaces look younger for a long long time! 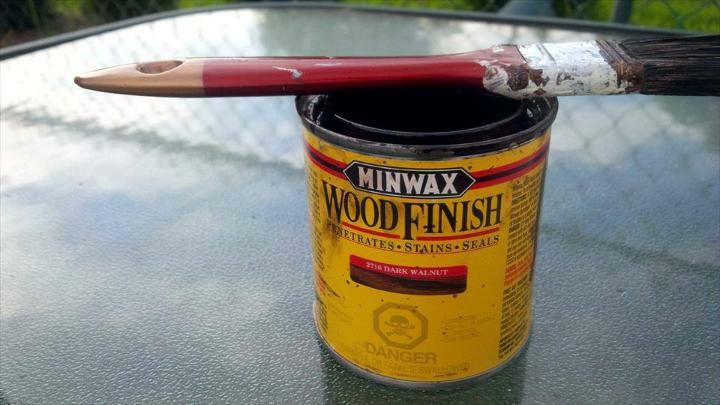 Use the paint brush to apply minwax coats, you can also prefer any other prefer wooden stain or sealant! 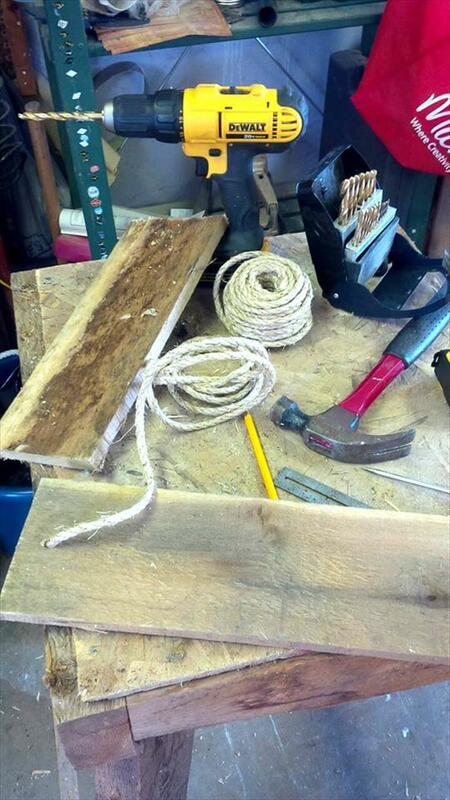 After getting the stain coats dried, the total assembly of caddy has been done with nails and rope has been added by making knots as you can see! Now it is all ready to gift to someone or for personal use! 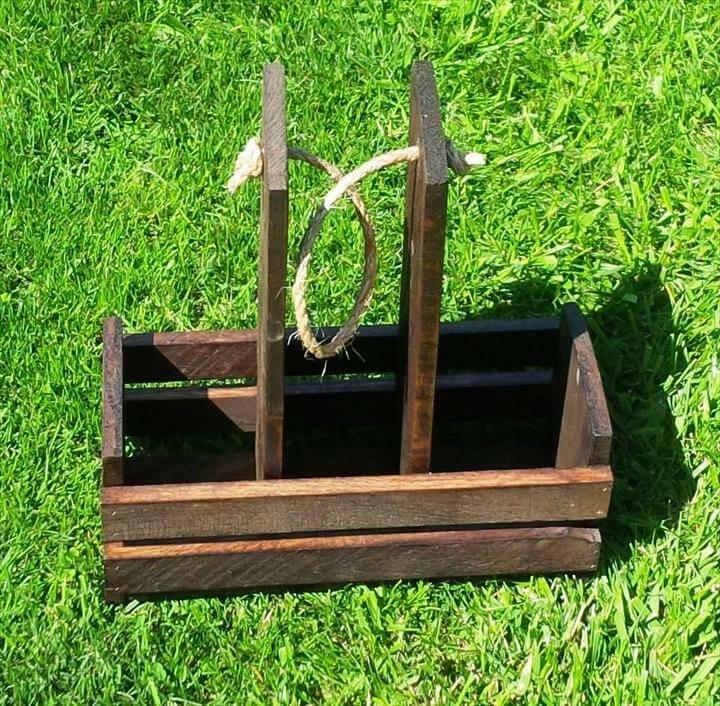 This beautiful little caddy would add fun to your picnic places, will be a way to carry your beverage with you! 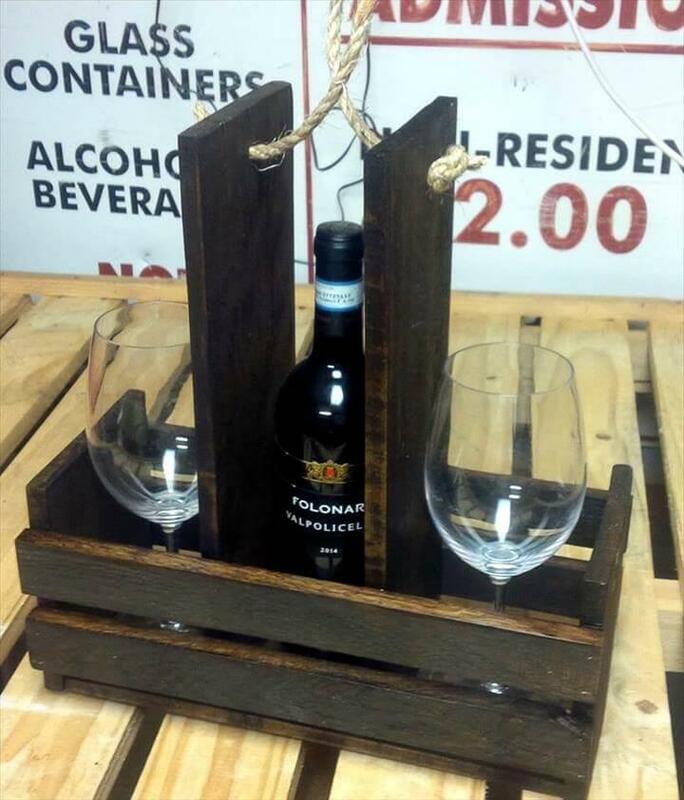 It is also a gift-worthy craft so can be used also in gift-giving, a beverage lover would be a best person to give this gift! Make personal using custom tags and symbols and also custom metal accents! One can also prefer paint to spruce its appeal up!